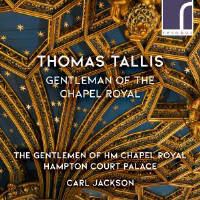 The Chapel Royal’s place within English music can hardly be overstated: during the reigns of the later Tudors its membership was a roll call of the most illustrious composers. One of these was Tallis, who probably composed the seven-voice Missa Puer natus est for it (it is widely believed that a meeting between the Chapel Royal and its Spanish counterpart, the Capilla Flamenca, was somehow involved). So it is fitting that the Mass is the centrepiece of a recording by one of its modern incarnations, alongside a handful of motets and responsories, and the somewhat earlier four-part Mass. All these pieces are exceptionally well served in the discography, especially the seven-voice Mass. It’s a luxury enjoyed by few pre-Baroque pieces, and one cannot help but listen to any new reading in that light. Everything is performed two-to-a-part by the men and the sound is pleasingly compact (worth mentioning, given how much seven-part music is involved). Where the music shapes itself and gives them clear leads (particularly in the four-part Mass) things go well, but in the seven-part music the impression is midway between a read-through and an interpretation. There are certainly idiomatic moments (the final Agnus Dei of Puer natus est, for example) but too often textures are static, with little sense of architecture or pacing. The blend of the pairs of voices isn’t always secure (try the penultimate chord of the four-voice Mass), with inevitable consequences for the overall sound and the projection of complex textures, and the tempo chosen for the Miserere nostri means that passing dissonances are unnecessarily emphasised. On the whole, the less ambitious music is the better served.